When William Langfitt was having a mental-health breakdown, his girlfriend called 911 expecting an ambulance. Instead, a Pierce County sheriff’s deputy arrived. 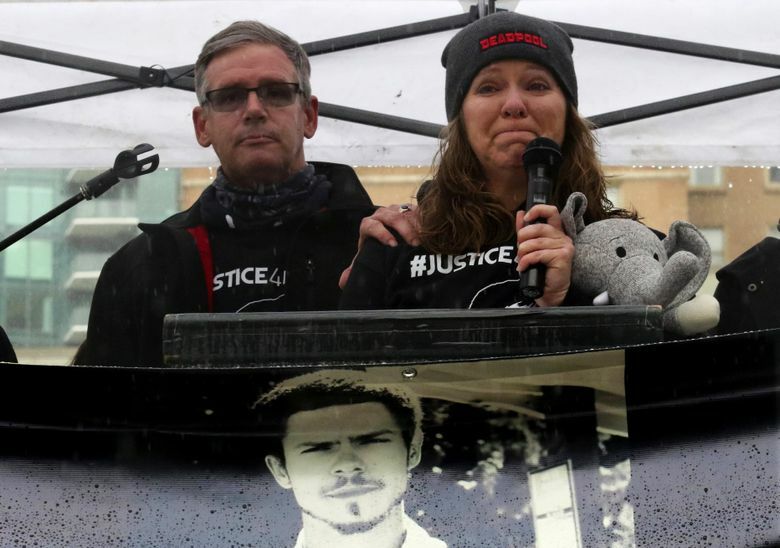 Loved ones and supporters of William “Billy” Langfitt rallied in downtown Seattle on Saturday to call for better training and greater accountability at the Pierce County Sheriff’s Department in the wake of the 28-year-old’s fatal shooting by a deputy during a mental-health breakdown last month. About 50 people turned out at Westlake Park to remember Langfitt, who died in Spanaway on March 16 after his girlfriend called authorities for help during an apparent mental-health crisis in which Langfitt was seen running in the street in shorts, a T-shirt and socks and jumping on cars, according to witnesses. When a deputy arrived and got out of his vehicle, the sheriff’s department says Langfitt charged at the deputy and got into the patrol car’s front seat, prompting the deputy to open fire. Many at the rally wore black T-shirts with “#Justice4Billy” on them to express their desire not to let Langfitt’s death happen in vain. Langfitt’s sister, Sabrina Langfitt, 26, said the family was caught off guard by the circumstances surrounding the incident because Langfitt hadn’t caused serious concern in the past. “He was so funny and he was always ready to clown off, so none of us ever expected this happened,” she said, adding that her brother had always expressed support for law enforcement. The shooting has led her to question her own faith the police. Naomi Powers was the person with him that night who called 911. Powers said Langfitt was dealing with the loss of his job and his grandfather’s death. At Saturday’s event, she said she told the dispatcher it was a mental-health emergency and that she needed help getting Langfitt to the hospital. She assumed an ambulance would be sent to scene to transport him, not the police. She also told the dispatcher that Langfitt initially had a folding knife but assured them repeatedly that she had secured it, according to the Tacoma News Tribune. The Sheriff’s Department said the deputy fired because he worried Langfitt would get the rifle in the patrol car and hurt others, the newspaper reported. The department and the prosecutor’s office are continuing to investigate. Powers said she believes their actions represented a rush to judgment. Langfitt’s death happened during a period of reckoning for law-enforcement in the region. Loved ones of other victims of police-involved shootings, including friends and relatives of Charleena Lyles, a single mother with mental-health issues who was fatally shot by Seattle officers last year, spoke at the rally. In January, a U.S. District Court judge ruled that the Seattle Police Department was in full compliance with the first stage of a consent degree reached with the U.S. Department of Justice that called for reforms to reduce excessive use of force. The decree came after the controversial shooting of woodcarver John T. Williams in 2010 by a Seattle officer. Days before Langfitt was killed, state lawmakers reached a deal to lower the legal standard for prosecuting an officer who uses deadly force. Powers wants to keep others suffering from mental-health issues from going through similar tragedies during encounters with law enforcement.